Telephony has made great strides by making use of the Internet as a backbone for communications using VoIP. Currently, audio/video offerings such as FaceTime and Skype are making it mainstream for everyday conversations to include video and audio, but bridging participants on traditional PSTN/VoiP networks into WebRTC-based video conferences is not trivial. 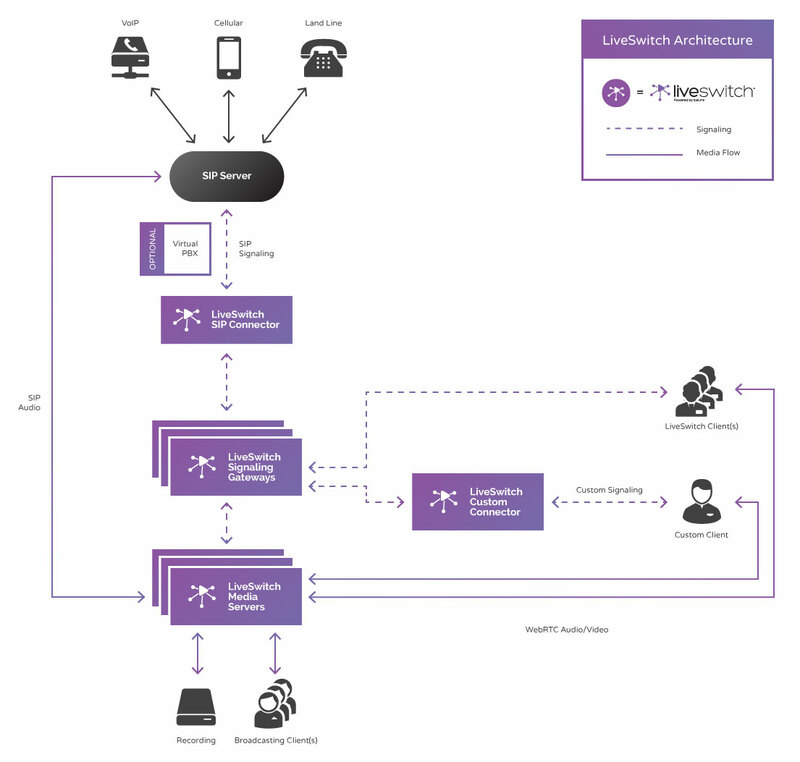 Frozen Mountain’s LiveSwitch provides the key RTC components required for developers to easily provide integrated voice, video, chat and data to their new and existing applications. LiveSwitch, features a complete SIP connector allowing you to integrate your existing Polycom, Avaya, Cisco (and more) telephony infrastructure into modern WebRTC-based conferencing platforms. LiveSwitch makes it easy to add voice-only VoIP/PSTN clients into your WebRTC conference calls. The SIP Connector service included with LiveSwitch lets you register your application with a SIP server (e.g. a SIP trunk or PBX) for the purposes of accepting incoming calls. Calls can be routed to a specific channel/session based on the inbound number, or you can add in a virtual PBX to intercept the call and prompt for an access ID. The inbound SIP audio stream is automatically routed to the LiveSwitch media server for forwarding/mixing to the other participants, while the outbound SIP audio stream is fed with a mix of audio from all the other participants. WebRTC signaling is used to control and monitor the conversations. LiveSwitch can also take the audio component of a stream, convert it to SIP media transport for VoIP, and also convert the returning VoIP audio into an audio-only LiveSwitch stream. At the same time, participants with full audio/video devices could share both audio and video with each other. LiveSwitch includes all the power of multiparty WebRTC media streaming and signaling in one complete package, ideal for server-based real-time applications with telephony. 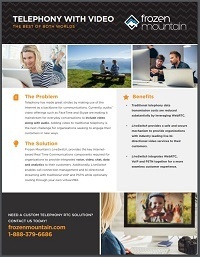 Several companies worldwide rely on Frozen Mountain to develop their telephony solutions and products. Contact us to see how you can also use Frozen Mountain's RTC products and services to be at the forefront of telephony delivery.